Stop by Booth #3718 to learn how this versatile mobile charging station is changing the game. “From the green to the restaurant, golf courses can put the station to use anywhere on their property,” said Yatra Operations Director Steve Smith. 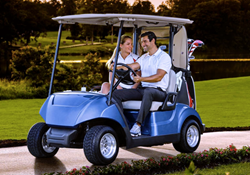 Join Yatra™ on January 24-26, at the PGA Golf Show in Orlando, Florida, as they debut the Power Station by Yatra™. This universal, fast charging solution enhances and fosters a more connected golf experience. The Yatra™ Power Station resolves charging needs, provides an excellent revenue model, and keeps players relaxed on the green. The Power Station by Yatra™ is a mobile solution to fast charging your smart devices on the go. The slim portable power bank (size of iPhone 5) pack an incredible punch, bringing your device from 0-70% in less than 30 mins while anywhere on the course. Built-in cables provide seamless connection and can change with technology. Yatra™ provides a serious revenue model for courses that elect to charge golfers for the use of a portable power bank. At just 5 dollars per round to rent, the system pays for itself in less than a month. On average, courses will net a 10x revenue on the rental system. Many private courses have adopted the Perk (free) system, which facilitates positive member feedback on convenience. “We are very excited to be a part of the PGA show in 2018,” said Yatra founder Roy Sharda. “We’ve had tremendous interest from golf courses looking to offer their community mobile charging. We are looking forward to showcasing our solution. Now more than ever, golfers are streaming music, using GPS and need to stay connected while on the course." Custom Branding Options – Fully customize and display company logos and designs on the illuminated Power Station system. Compact – Fits easily on countertops or host stands. Each charging system holds 8 ultra-slim power banks for multi-customer use. Universal – Each power bank comes with built-in detachable Lightning and Micro USB cables, individually equipped with USB ports permitting their replacement as technology changes. Convenient – Allows customers the peace of mind to keep their devices with them while charging on the go. Quick Charge – Yatra™ power banks are equipped with 8, 4000mAh lithium polymer batteries that power the iPhone or Android device from 0-70% in 30 minutes. Theft Protected – Each charging station uses Luna Pulse Technology to charge each individual power bank, therefore allowing it to only be charged while resting in the base station. GPS technology can also be used as a theft deterrent. Battery Superiority & Cable Durability – Yatra™ has partnered with Intertek—a global leader in R&D quality control—to test product quality. “From the green to the restaurant, golf courses can put the station to use anywhere on their property,” said Steve Smith, Operations Director at Yatra. The Power Station by Yatra™ sold out of all inventory after debuting at the National Restaurant Association’s Expo in May 2017 and is gaining national attention in the restaurant and lounge markets of Las Vegas, New York City, and Chicago. The Power Station by Yatra™ can be found at fine dining establishments, including renown STK Steakhouse, Prime and Provisions, and Chicago Cut Steakhouse. To coordinate an interview with Yatra™ founder Roy Sharda, contact Brooke Daily at brooke@veteranpr.com. For additional information, please visit http://www.shopyatra.com.